The Backup Process that fails once can get you fired, even if it worked perfectly 100 times before. In this 45-minute webinar you will learn the top five ways that backup can get you fired and how to keep that from happening. 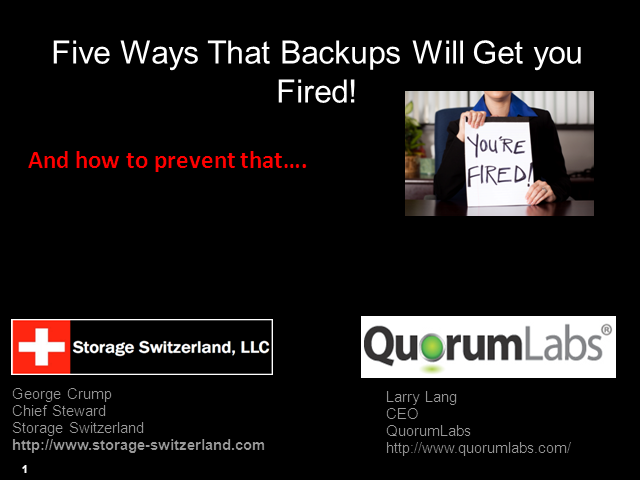 Join George Crump, Lead Analyst at Storage Switzerland and Larry Lang, CEO of QuorumLabs for this candid discussion on what can go wrong in the backup process and how to prevent it - so you don't end up unemployed. 1) Backup window isn’t met - Yes, backups matter too. There’s been a lot written about how “it’s all about recovery”, and while that’s certainly true, if the backup is incomplete the recovery will be too. You need to focus on both backup and recovery. 2) Data isn’t restored on time - You need to address the hidden steps most backup systems require (and users don’t think about) - recovering data that’s traversing the network and making sure that the data is usable. 3) Servers and applications aren’t restarted on time - More things that users and managers don't think about - re-order servers, rebuilding servers, reloading applications. 4) Backups are done but data is not offsite and usable - Data must be in usable condition with servers ready to attach. A backup that’s not safely stored is as useless as one that’s not done at all. Disasters don't happen when it’s convenient. 5) Lack of adequate testing - This is the assurance part of the data protection process. If the recovery doesn’t work, for any reason, you have a problem. This happens because most backup systems don’t get tested very often - or tested completely enough.